What would the rest of your life look like if you remembered your purpose for being? What if there was a way for you to remember who you truly are? Are you ready to live more artfully, sacredly and skillfully? Do you want a life that expresses your values, visions and talents? To Purchase the book visit our Buy the Book page! 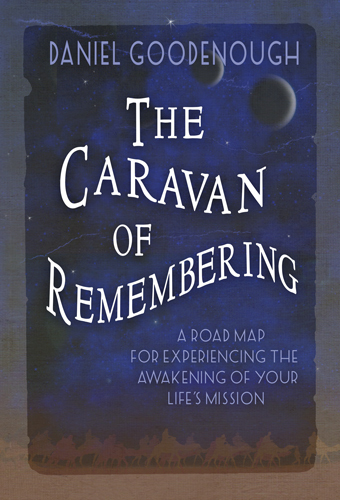 Written as a fictional experiential journey that allows you to reflect on your own journey in a contemplative context. Integrates the material and spiritual worlds in ways that are viable, practical, motivational and enduring. Unique and time-tested material, grounded in Daniel Goodenough's 30 years of working with thousands of life mission seekers. Inclusive of all spiritual paths and traditions, many of which are highlighted in the book. Timeless teachings of many wisdom traditions woven into the story, speaking to the larger life mission thread on the spiritual journey. An extensive curriculum of exercises to support you through your 'purpose process'. "My wish is that you fall so much in love, and fall so completely, that you once and for all surrender into your passion and purpose."